What Motor Trend is dubbing as the Jack of all trades, has won the over to choose the new Volkswagen Golf as the 2015 Motor Trend Car Of The Year. It was back in 1985 when the VW Golf claimed its title for Motor Trend Car Of The Year and now, almost 30 years later it has risen to fame once again. The new 2015 VW Golf has been more of a background sleeper but with its multi-level trim offerings and abundant engine portfolio, it begs to appease a wide range of consumers and even picky enthusiasts. 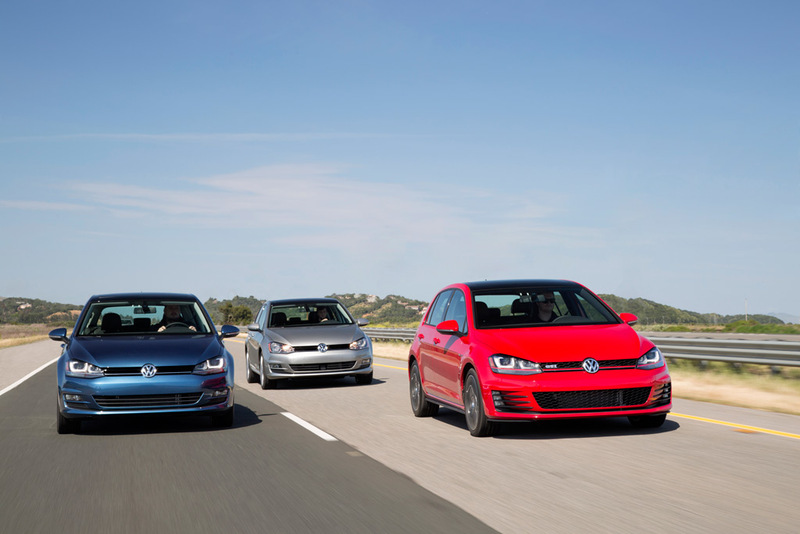 Herndon, VA / Los Angeles, CA — Motor Trend, one of the world’s premier automotive authorities, today named the Volkswagen Golf family—Golf 1.8T, Golf TDI® Clean Diesel, Golf GTI and e-Golf models—as the 2015 Motor Trend Car of the Year. The 2015 Motor Trend Car of the Year award was presented to Michael Horn, President and CEO, Volkswagen of America, during an announcement Thursday morning. Motor Trend’s Car of the Year program is open to any all-new or substantially upgraded 2015 automobile. Rather than being compared against one another, contending vehicles are first put through Motor Trend’s full battery of performance tests to measure acceleration, braking, and limit handling. Design Advancement—well-executed exterior and interior styling; innovative vehicle packaging; good selection and use of materials. Engineering Excellence—total vehicle concept and execution; clever solutions to packaging, manufacturing and dynamics issues; cost-effective tech that benefits the consumer. Efficiency—low fuel consumption and carbon footprint, relative to the vehicle’s competitive set. Safety—a vehicle’s ability to help the driver avoid a crash, as well as the secondary safety measures that protect its occupants from harm during a crash. Value—competitive price and equipment levels, measured against those of vehicles in the same market segment. Performance of Intended Function—how well the vehicle does the job its planners, designers, and engineers intended it to do. After 9 full days of testing, driving and deliberating, Motor Trend selected the Volkswagen Golf as represented by four powertrain derivatives as its 2015 Car of the Year. The seventh-generation version of Volkswagen’s best-selling model is bigger, lighter, more fuel-efficient, and even more versatile than the previous Golf model. Based on the new Modular Transverse Matrix (MQB) architecture, the German-engineered 2015 Golf family is currently available in four different versions: fun-to-drive Golf 1.8T, frugal Golf TDI Clean Diesel, sporty Golf GTI and the all-electric, zero-tailpipe emissions e-Golf. With a host of newly available driver assistance features and excellent EPA estimated highway fuel economy, the all-new Golf is a standout in the compact class. Reinforcing this, the lineup will be rounded out in early 2015 with the all-new 292-horsepower, all-wheel-drive Golf R and the Golf SportWagen range. With a starting price of $17,995 (plus $820 destination and handling) for the 2-door Golf S model, the 2015 Golf family offers advances in interior refinement, exterior styling, and a wealth of new equipment at even the lowest trim lines; the result is truly a Golf for everyone. For more information about the award, judging process, and the contenders, check out the January 2015 issue of Motor Trend, visit www.motortrend.com and search the hashtags #MTCOTY, #VW and #Ready.Set.Golf on Twitter, Instagram and Facebook. Founded in 1955, Volkswagen of America, Inc., an operating unit of Volkswagen Group of America, Inc. (VWoA) is headquartered in Herndon, Virginia. It is a subsidiary of Volkswagen AG, headquartered in Wolfsburg, Germany. VWoA’s operations in the United States include research and development, parts and vehicle processing, parts distribution centers, sales, marketing and service offices, financial service centers, and its state-of-the-art manufacturing facility in Chattanooga, Tennessee. The Volkswagen Group is one of the world’s largest producers of passenger cars and Europe’s largest automaker. VWoA sells the Beetle, Beetle Convertible, Eos, Golf, GTI, Jetta, Jetta SportWagen, Passat, CC, Tiguan, and Touareg vehicles through approximately 649 independent U.S. dealers.